We Move and Ship car's,busses,trucks,Containers Worldwide. 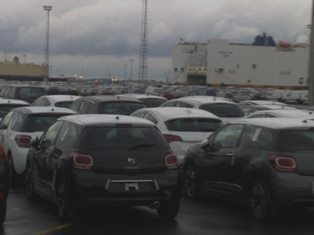 Refering to the Antwerp regulations for acceptance of secondhand vehicles on the different terminals in which it is stated that cargo loaded inside a vehicle can only be accepted on terminal if easy accesable for deeper control. Port authorities announced to perform more deeper/stricter control on this subject and block/fine shippers/cargo not adhering to this subject. We therefore kindly remind you that vehicles with cargo loaded insided will only be accepted on terminal if cargo compartiment can easily be opened without the use of a cuttingmachine and/or welder. Units of which compartments are sealed by foam will also be refused entrance. However if compartment is locked by means of padlock and/or iron bars which can easily be romeved/broken with the use of a simple punch will still be accepted. We are still negotiating with Port authorities on final date of implementation and consequent refusal of such units and will revert as soon as agreed. Hoping to have informed you.